While cruising craigslist one night a couple of weeks ago, I came across a wooden bench that had a rudimentary look I loved. I didn’t need a bench, but contacted the seller anyway, asking if he could make two chairs and a table for me, based on the bench, but with some modifications. He agreed, and that’s how I met Raul Gallego, Jr., the world’s most easygoing carpenter. Raul, and his father, Raul Sr., work out of their shop in LA. producing furniture and finishing it in amazing faux-aged painted surfaces. Raul Jr. not only took my ideas to heart but he made alternate versions which he emailed to me for approval … I asked him to finish my pieces in a concrete gray color and he nailed it. 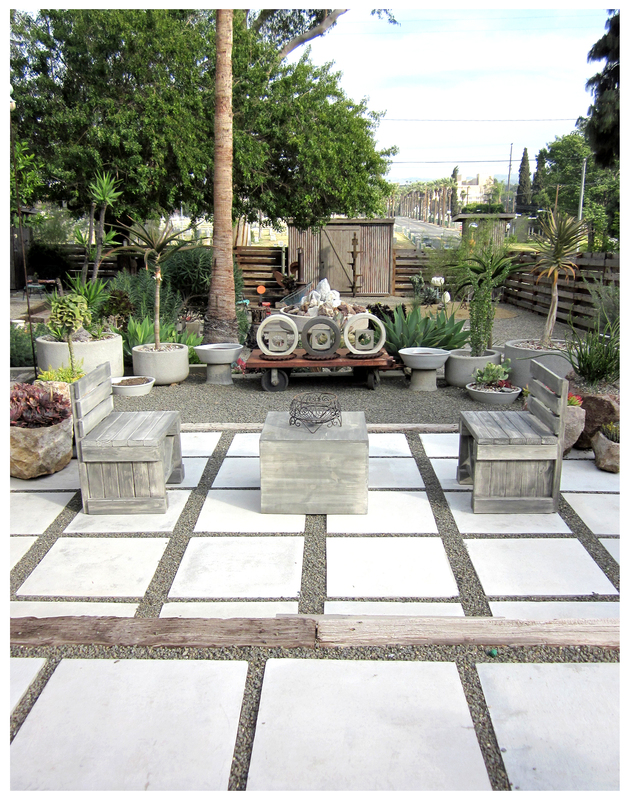 We picked the pieces up Saturday morning and when we got them home I was happy to see they fit the space perfectly: adding a sense of perspective to the lower tier, with its large concrete pavers. I can’t recommend both Rauls enough; contact them at their website by clicking here. I love graphic design, concrete shapes and industrial materials. So, I combined all three in this focal point between the tiered area and the planting bed beyond. 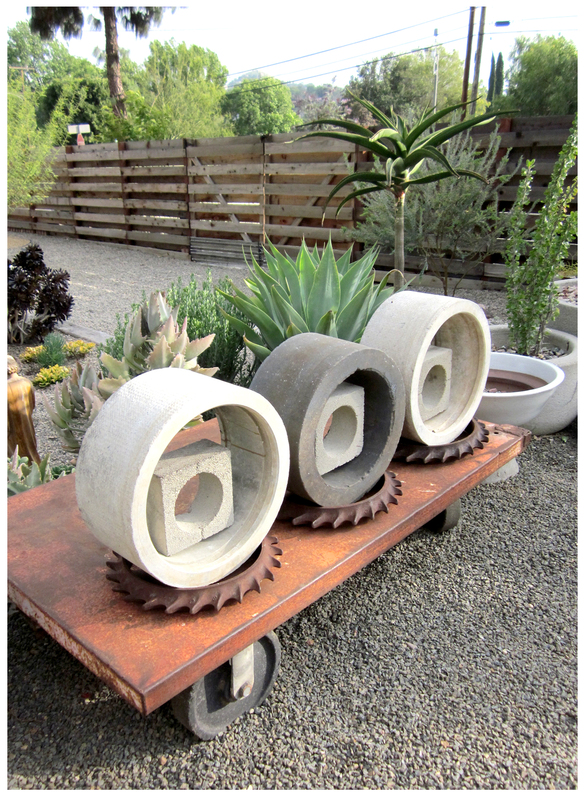 Two concrete rings flank an abrasive grinding ring, with circle-in-square concrete bricks inside each; I stabilized the trio by resting them inside heavy rusted steel gear-things. Repeating graphically atop the large industrial dolly I got at a neighborhood garage sale, I think they look really cool: the peek-a-boo effect is nice and the circles help visually soften the massive rusty wagon. 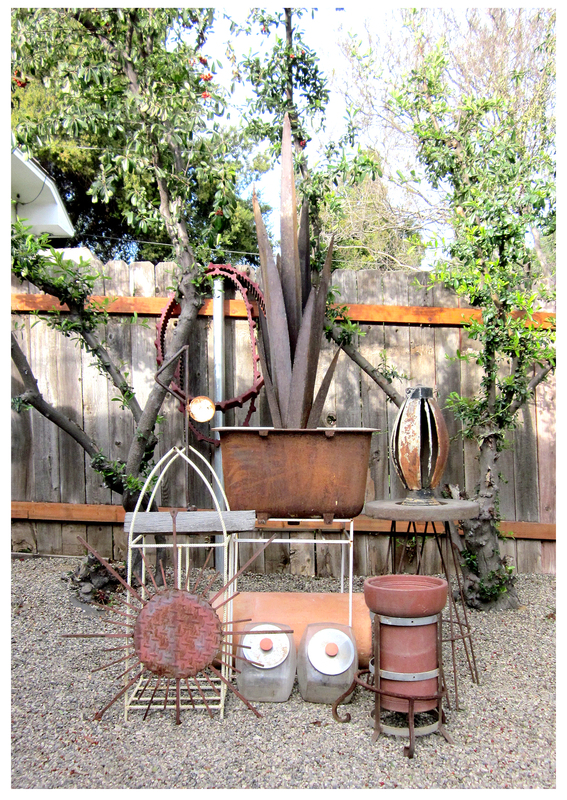 More industrial and random junk elements create a point of interest at the end of a previously-empty corner of the garden. No plants here, I wanted this area to be a departure, a stand-alone sculptural grouping. 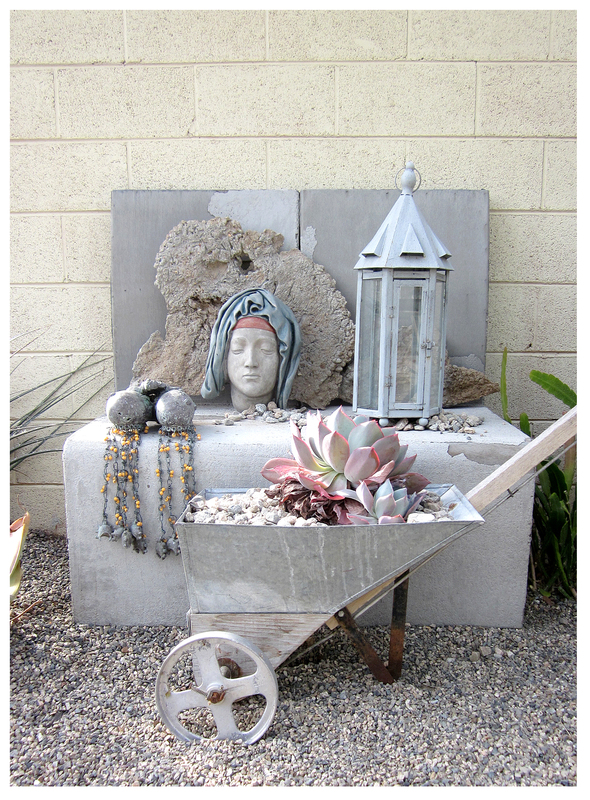 Against the back wall, two stuccoed wooden chairs are crumbling attractively and creating a nice surface on which to display a collection of similarly-colored pale objects, including: a hardened concrete puddle, a dozing concrete Madonna, a metal lantern, a fertility fetish, and an old grass seed spreader planted with a terrific echeveria. Does it all go together? Of course — unifying colors and similar materials make it work. I receive email announcements of local estate sales and thankfully they include photos. Usually the photos show me the reasons I shouldn’t go: lots of oldie, moldy, granny fare in ill-repair and off-taste … but the sale held last Friday had several things that caught my eye. Enter Paul, retiree-enabler, who was able to be there when it opened at 8 a.m. and I was on my way to work in LA. His shopping list included a turquoise two-piece sectional and this homemade metal sunburst; happily he was able to score both! The sofas are slated for future reupholstering, but the sunburst was able to go right up on the wall where it looks terrific … made by the late doctor/homeowner, I love its scale and rusted-painted surface. Also accomplished today: spot-pruning and trimming, deep cleanup around plant bases, hiding undesirables and planting the recently-acquired ‘rock’ planters (they’re not actual stone, as we first thought, but a simulation, probably terra-cotta composite). The temple area was added to as well. With today’s burst of garden activity I’m finally feeling like I won’t embarrass myself during the garden tour and visitors will see a garden unlike most! wow, triple wow !!! j’adore, c’est beau, stylé, magnifique, superbe & many superlatives more. I see the graphic designer in evry corner of your garden. My friend, you’ve got quite the eye. Fantastic work. Great way to start a Monday morning. 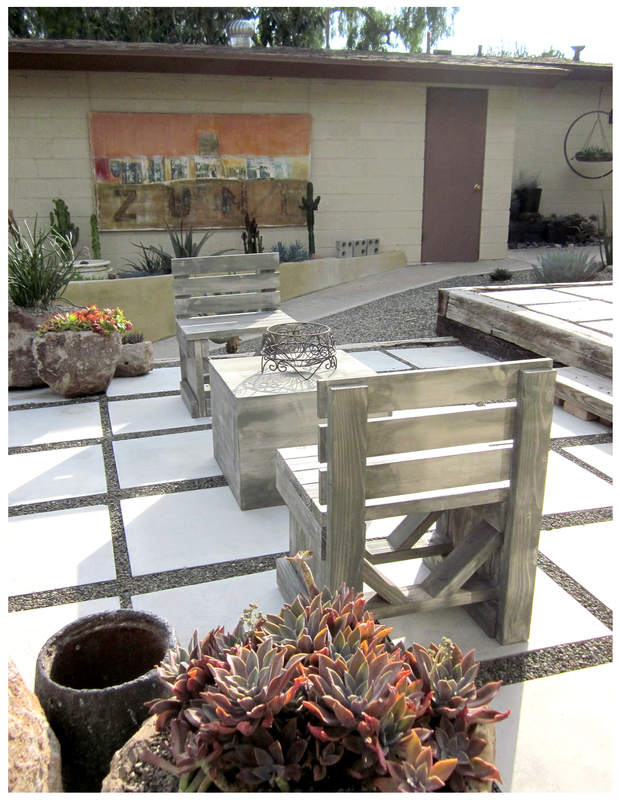 I’m just dying to do something like this to my yards. I few weeks ago I toured some Palm Springs homes during Modernist Week. I was drooling over the gravel and concrete. BTW, your new furniture is rockin’. Thanks, I like how clunky, simple it is, too! How do you keep improving on perfection? Just when I think it can’t get any better then you blow it out of the water. Amazing. 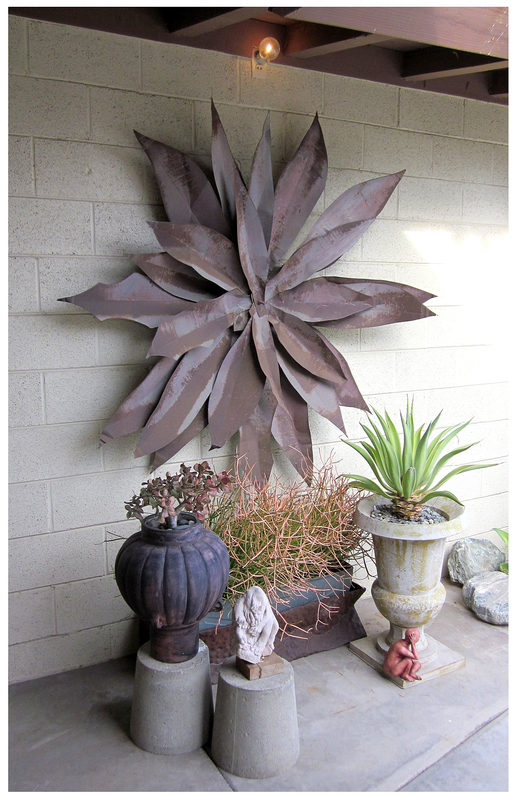 I especially love your new metal wall sculpture and the rusted metal “plant” in the fourth photo. Gee, thanks, Loree… How do I do it? well, it doesn’t involve sleep! I love those rusty things, too, vive la rust! Hi Reub and Paul, just saw your beautifully decorated yard with the benches and table. Thank you for the reviews on Raul Jr.’s craftsmanship, also I appreciate the inclusion of my site-www.raulsfauxfinishing.com–Best, Raul Gallego Sr…Keep up the beautiful work, from one artisan to another. You’re welcome, Raul… I appreciate the good work and attention to detail so much! Hard to pick favorites but confess an affinity for the concrete rings and that giant estate sun. But it’s all fabulous. And I love how the little red thinking man migrates from vignette to vignette. Raul’s work is wonderful! Ha! You noticed that my little garage sale mascot moves around … Raul’s a real find, so amenable to suggestion, and into the process … the rings and the sunburst both are terrific, it’s so fun when an idea pans out! Your new furniture is really cool looking and unusual. When I finally get around to replacing the stuff I have, I know where to look! Also, the sunburst? Drool. I love the new furniture, too… craigslist has been the hook-up! that is some serious awesomeness!!!!! the tour is in april, right? Hiya, the tour dates are April 9th & 10th; I’ll do a quick post with particulars this weekend… And thanks for the compliment!